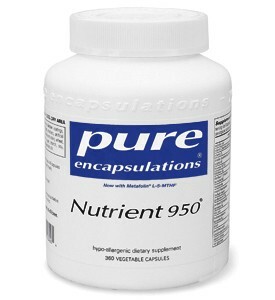 *Nutrient 950 is a complete hypo-allergenic, high-nutrient, bioavailable multi-vitamin, multi-mineral and trace element supplement. It offers an advanced mineral delivery system, and the highly desirable coenzyme forms of B vitamins to promote optimal absorption of the nutrients. In addition, it provides a high profile of free radical scavenging antioxidants. 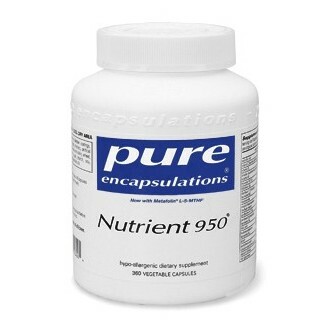 This is a gentle, hypo-allergenic formula which is well tolerated by sensitive individuals. As part of a well-balanced diet that is low in saturated fat and cholesterol, folic acid, vitamin B6 and vitamin B12 may reduce the risk of vascular disease. FDA evaluated the above claim and found that while it is known that diets low in saturated fats and cholesterol reduce the risk of heart disease and other vascular diseases, the evidence in support of the above claim is inconclusive.